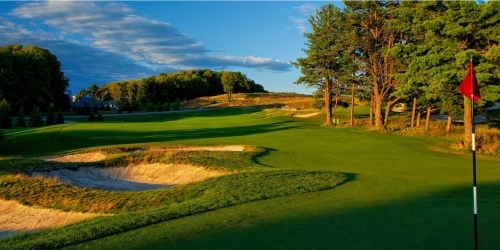 LochenHeath Golf Club rests on a scenic bluff overlooking East Grand Traverse Bay and offers all of the amenities that any golf group desires. Elegant comfort greets our guests of the Cottages as you enjoy this breathtaking setting. The Cottages are the first to be built in a six cottage enclave located just a short stroll from the clubhouse and practice facility. Members and guests can enjoy the great room at the clubhouse for business meetings and private dining and relax next to the cozy outdoor fireplace. The spacious layout includes four en-suites with a flat screen TV, an expansive common living area including hardwood floors, and a gas fireplace. The designer kitchen features custom cabinetry, stainless appliances, an ice maker, dishwasher, microwave, coffee maker with an island bar. For added convenience, the Cottages are equipped with a washer and dryer. Catered meals and beverages are available for our members and guests comfort. Golfers can unwind with a powerful wall shower and overhead rain soaker after a great day of golf. The comfortable outdoor screened-in deck will become a favorite gathering place at the end of the perfect day. Our spacious cottages offer accommodations for up to eight guests with lockout capabilities for a couple or groups of two. The on-site restaurant and the tiered outdoor patio provide unparalleled views of Lake Michigan, setting the ideal backdrop for one of northern Michigan's top culinary destinations. LochenHeath Golf Club reserves the right to change price and offer at anytime. Prices and offer are subject to change without notice. GolfMichigan.com is not responsible for errors posted in this golf package.